The artist's estate, and thence by descent to the present owners. peintures, pastels et acquarelles, Paris, 1961, p. 44, no. 312 (illustrated pl. 73). R. Marx, Maîtres d'Hier et d'Aujourdhui, Paris, 1914, p. 317. L. Rouart, Berthe Morisot, Paris, 1941 (illustrated p. 44). F. Mathey, Six Femmes Peintres, Lausanne, 1951, no. 20 (illustrated p. 7). D. Rouart, Berthe Morisot, Paris, 1954 (illustrated pl. 55). J.-D. Rey, Berthe Morisot, Paris, 1982 (illustrated p. 76). A. Clairet, D. Montalant & Y. Rouart, Berthe Morisot, 1841-1895, Catalogue raisonné de l'oeuvre peint, Montolivet, 1997, no. 316 (illustrated p. 268). Paris, Galerie Durand-Ruel, Madame Manet, Exposition de son oeuvre, March 1896, no. 26. Paris, Galerie Durand-Ruel, Berthe Morisot, April - May 1902, no. 7. (1841-1895), November 1919, no. 42. Paris, Galerie Marcel Bernheim, Réunion d'oeuvres par Berthe Morisot, June - July 1922, no. 7. Paris, Galerie Bernheim-Jeune, Exposition d'Oeuvres de Berthe Morisot, May 1929, no. 26. Paris, Musée de l'Orangerie, Berthe Morisot, Summer 1941, no. 99. Copenhagen, Ny Carlsberg Glyptothek, Berthe Morisot, Malerier, Akvareller og Tegningen, August - September 1949, no. 43. London, The Arts Council of Great Britain, Berthe Morisot, An Exhibition of Paintings and Drawings, 1950, no. 48. Toronto, Art Gallery, Berthe Morisot and her circle, Paintings from the Rouart Collection, 1952, no. 19 (illustrated); this exhibition later travelled to Montreal, Museum of Fine Arts; New York, Metropolitan Museum of Art; Toledo, Museum of Art; Washington, D.C., Phillips Collection; San Francisco, California Palace of the Legion of Honour and Portland, Art Museum. Paris, Musée Jacquemart-André, Berthe Morisot, 1961, no. 83. Vevey, Musée Jenisch, Berthe Morisot, June - September 1961, no. 69. Lodève, Musée de Lodève, Berthe Morisot, Regards pluriels, June - October 2006, no. 45. Relaxed and even knowing, the young woman holding her wide-eyed cat engages the viewer directly with her gaze. Painted in the summer of 1892, La jeune fille au chat is filled with a sense of movement that is heightened by the elegant swirl of the brushstrokes, which Morisot has guided with infinite grace and the impression of ease. The picture reveals a deep sensitivity to the way in which light falls on the young woman, justifying Morisot's claim to a position at the forefront of the Impressionist movement, with which she exhibited in seven out of their eight shows (it was only illness that caused her absence on one occasion). It is a credit to the quality of La jeune fille au chat that it has featured in several exhibitions of Morisot's works, not least the posthumous retrospective held at Durand-Ruel's in 1896, shortly after her death. La jeune fille au chat is charged with a tension that borders on the sexual. This was a new characteristic of Morisot's work that came to flavour several of Morisot's works during this period. Perhaps it was the success of her exhibition at Boussod et Valadon earlier that year, perhaps the death of her husband a month before that, or even some combination of these factors that led to her painting a group of works that addressed the sexuality of her model in a way that had only been touched upon in the most oblique manner in her earlier works. It has been posited that the death of Eugène Manet, while leaving her distraught, had also resulted in a break from the confining views of the men in her life of the direction in which her art should be taken. La jeune fille au chat, in this context, shows the artist, now in her fifties, creating something fresh, perhaps even rebellious, a bid for freedom of some form. This sense of sexual content is heightened by the presence of the cat which, despite its apparent languor, could well be a reference to the famous painting Olympia by her brother-in-law Edouard Manet. 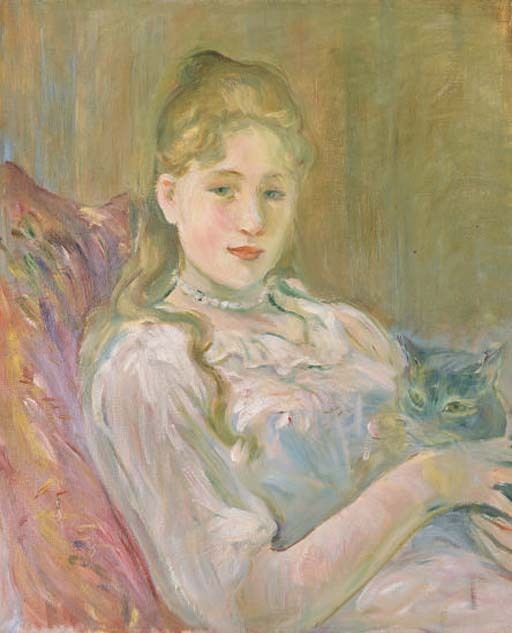 It is a tribute to the suitability of the model, Jeanne Fourmanoir, that she had, just prior to the period in which La jeune fille au chat was painted, featured in some of the pictures by Morisot's friend and fellow artist, Pierre-Auguste Renoir.